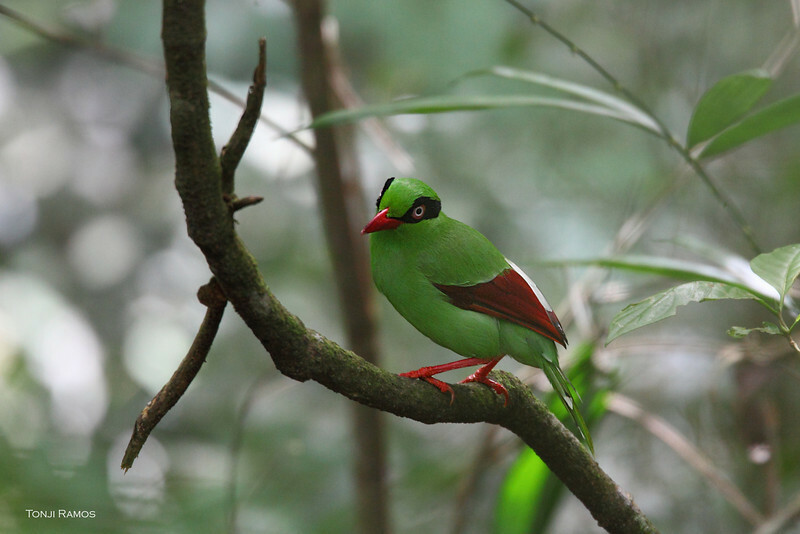 Short-tailed Green Magpie Cissa thalassina, 30-35cm I was only able to bird for two days. But on the second day I was already seeing several of the birds I saw the previous day. So I invited my son to go with me to try one of the trails to look for the Whitehead's Trogon. It seemed like it was one of "the" target birds for the area. We did not see the Trogon but we did see a White-crowned Forktail and this very colorful bright green bird, a Short-tailed Green Magpie. It is slightly bigger than a Black-naped Oriole and its a loud bird. My son had his binoculars and he spotted the bird for me while I adjusted my settings to the dark and variable conditions near the Liwagu River. We saw a pair but they were difficult to shoot because they were hiding in the dark parts of the forest growth. We worked well as a team and were rewarded one decent perch to get the bird. What a gorgeous bird! I love that Magpie!!!!! God is so creative, isn't He?